Risotto with saffron, is also known as “Risotto alla milanese”, being the staple food of the city of Milan in Italy. Legends about this risotto date back to the Middle Ages, when it is told that Sicilian merchants would travel all the way north to Milan, bringing spices along for trade. They would cook steamed rice adding saffron for color and flavor. It was not until the 17th century that the real Risotto alla milanese is cooked in the kitchens of affluent families in Milan. The rice would be prepared with butter, saffron, cinnamon and 6 egg yolks “to give the rice a nice yellow color” (yes, no kidding, 6 egg yolks). That recipe evolved over the centuries to become the current version we all know: rice cooked with onion, white wine, stock and saffron. Today, keeping the original recipe in mind, we’re going to tweak it, and make an healthier version of this risotto. First off we’re going to use brown rice instead of white rice. I used brown arborio rice but Japanese short grain brown rice works perfectly too. Remember that brown rice takes twice the time to cook than white rice, but we know that it’s so much better for us, don’t we? So it’s worth the extra work. Also, we’re using some fresh ginger together with the onion. It adds a bit of spiciness that works really well plus it brings a whole range of health benefits with it. 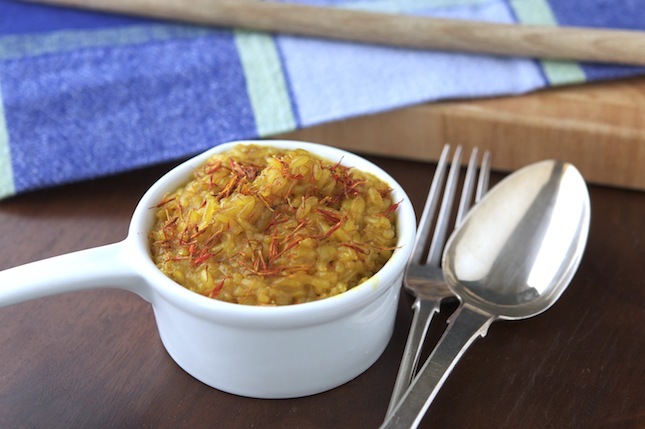 Finally, we’re not just using saffron, but also a good amount of turmeric. This spice is a health wonder so good for us. There’s never enough turmeric in your life. The rest stays: white wine, vegetable stock and Parmesan cheese. I’m sure you’re going to love this version of Risotto alla milanese. Give it a try! 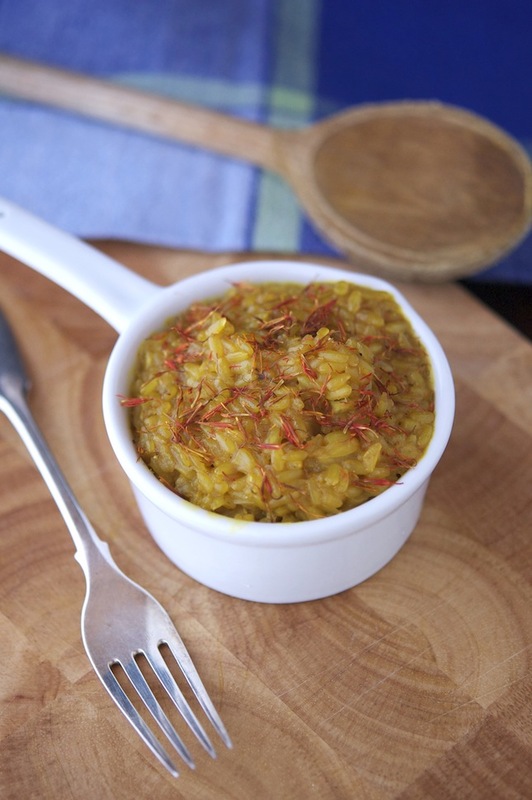 Saffron Brown Rice Risotto With Ginger and Turmeric Print this recipe! Bring stock to a low simmer in a medium pot. Season well and turn the heat low. Heat the oil in a large nonstick frying pan or wide, heavy saucepan and add the onion and ginger. Cook, stirring, until the onion begins to soften, about 3 minutes. Add the rice. Cook, stirring, until the grains of rice separate and beginning to crackle, about 3 minutes. Stir in the wine and cook over medium heat, stirring constantly. The wine should bubble but not too quickly. You want some of the flavor to cook into the rice before it evaporates. When the wine has just about evaporated, stir in a ladleful or two of the simmering stock (around ½ cup), enough to just cover the rice, together with the saffron and the turmeric. Cook, stirring often, until it is just about absorbed. Add another ladleful or two of the stock and continue to cook in this fashion, not too fast and not too slowly, stirring often and adding more stock when the rice is almost dry, until the rice is cooked, 40 minutes or so. It’s brown rice so it’s going to be a little bit crunchy on the outside but make sure that it’s not too hard in the middle. When the rice is cooked, add a generous amount of freshly ground pepper. If you're an omnivore, stir in the Parmesan, butter, and little bit more of stock. Remove from the heat. Cover and let sit for 2 minutes before serving. How Many Calories In One Gram Of Sugar?